American Idol judges Katy Perry, Luke Bryan and Lionel Richie saw an influx of returning hopefuls, such as Alyssa Raghu, as well as new incredible talent -- including former 90 Day Fiance star Evelyn Cormier, Ashley Hess, and Elizabeth Gaba -- during Sunday night's two-hour episode on ABC. The seventeenth season of American Idol continued with the three judges critiquing aspiring singers in Louisville, KY; Coeur d'Alene, ID; Los Angeles, CA; New York, NY; and Denver, CO.
Fourteen hopefuls were shown receiving Golden Tickets and making it through to the next round. Ayssa Raghu, a 16-year-old high school student from Orlando, FL, made it all the way to the Top 24 last season. At the time, Katy told her she had a "forgettable" presence but not a forgettable voice. Alyssa therefore remedied the situation by taking voice lessons and dance classes. She also performed in over 200 live shows. For her audition, Alyssa sang V V Brown's "Shark in the Water." Katy said she missed Alyssa's voice, and the singer gave Luke goosebumps. Lionel got a little "teary-eyed" by her vocals because she was a little bird who flew back to the nest "shining." Lionel gushed about how proud he was of Alyssa, and Luke said she had a comfortable and natural delivery. Katy, however, said her guitar skills aren't on the same level as her voice, and so maybe she should have someone accompany her going forward. 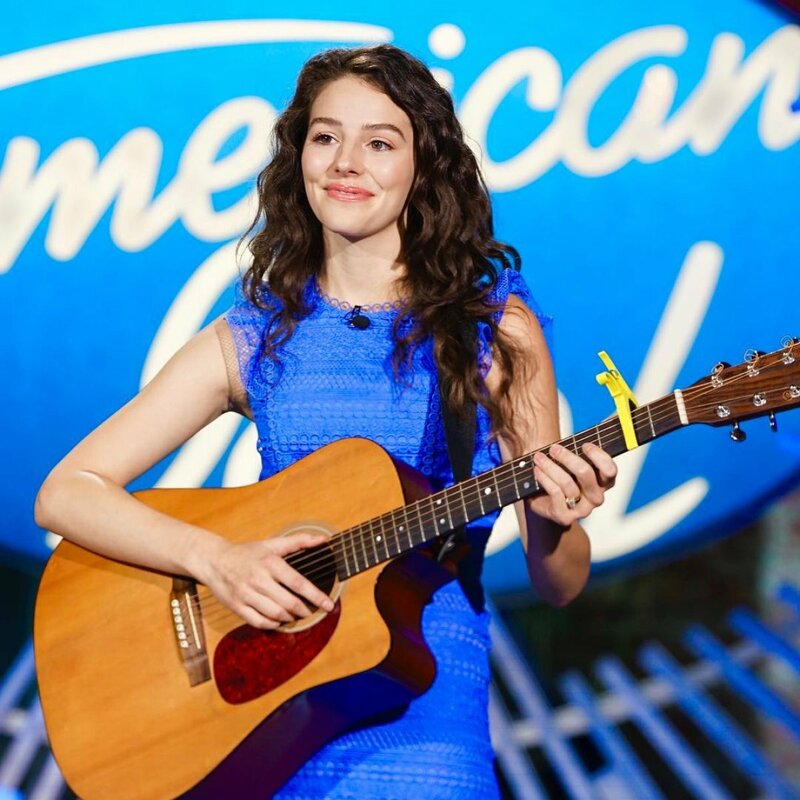 Other singers who previously auditioned for American Idol and were given Golden Tickets this season were Kay Kay, an 18-year-old pizza restaurant employee from Nashua, NH; Tippy Balady, a 17-year-old high school student from Dallas, TX; Isaac Streetman, an 18-year-old musician from Rockmart, GA; and Payton Taylor, a 22-year-old airport singer from Nashville, TN. Evelyn Cormier, a 19-year-old teacher from Claremont, NH, who starred on Season 5 of 90 Day Fiance with her now-husband David Vazquez Zermeno, mentioned before her audition how married life with David is "good" but things were hard their first year together given David had traveled to America from Spain to be with her. Evelyn, however, called David her "biggest supporter" in music. She then performed a haunting rendition of Chris Isaak's "Wicked Game," and Katy gushed about her having "literally one of my favorite voices I've ever heard in my life." Luke said Evelyn is going to bring "something crazy" to the table once she has a band behind her and Lionel and Katy were amazed by how she pushed air through her voice. Lionel admitted he was so glad to have her in the competition, and then Katy asked her to pick the right songs going forward because she's her favorite. Katy called Evelyn's voice "soundtrack material" and added she's "an incredible talent." Ashley Hess, a 27-year-old dental hygienist from Fremont, CA, performed Norah Jones' "Don't Know Why" for her audition. The judges interrupted Ashley's performance because it was so great and then sat around the piano while she finished it. Ashley absolutely serenaded the judges, and they were in awe of her as she sang so sweetly. Ashley said she "got a late start to music," but Katy insisted, "I think you could win this whole thing." Lionel agreed she could knock this out of the ballpark. When Ashley pointed out she has a lot of work to do, Katy disagreed, saying, "Just be yourself." Gaba, a 19-year-old college student from Los Angeles, CA, performed Adele's "All I Ask." Luke said she has a very pretty and solid voice but a little growl and grit would take her from a 9.5 to a 9.9 on a scale from 1-10. Katy also found her performance "incredibly moving." Jacob Moran, a 24-year-old geriatric nurse from Dansville, MI, sang Ariana Grande's "Into You." "If I didn't have all my hairs lasered off, they'd be standing up!" Katy said. The judges were shocked Jacob never pursued singing as a career and that he's only participated in local, downtown karaoke. Luke said he has an "incredible voice" and compared him to the lead singer of Rascal Flatts. Katy added Jacob has the best voice she had heard in Kentucky thus far and Lionel called his voice "gorgeous." With three yeses, Jacob was sent to Hollywood. Colby Swift, a 19-year-old fence painter from Midfield, TX, performed Cody Jinks' "Cast No Stones." The judges agreed Colby was good, but he confessed he was "very nervous." Luke saw himself in Colby and called him "interesting." Katy acknowledged Colby has "got something" but he's "inconsistent" and "needs a lot of work." Lionel noted his magnetism can't be taught and he's got something that made the panel pay attention to him. Luke admitted, however, Colby is "so unpolished." Regardless, the aspiring singer received a Golden Ticket because he had a great presence about him and a natural, raw talent. Peach Martine, a 16-year-old high school student from Miami Beach, FL, belted out "Zombie" by The Cranberries. Katy laughed about how she sounded like a robot, and so the judges asked her to sing a second song. She therefore followed that up with original tune the judges really liked. Luke said her imitation of The Cranberries' lead singer was too dead-on but her second performance showed some character and flare. Katy, however, asked Peach to loosen her curls and have more fun. Katy gave her an "encouraging no," asking the artist to show her "true authentic self," going forward. Lionel and Luke, however, were enough to carry Peach to Hollywood. Dalton Elliott, a 26-year-old construction worker from Chincoteague Island, VA, sang "Boy" by Lee Brice for his audition. Dalton had put his career on hold for his son, but the judges believed he's ready because he's got a great tone and storytelling ability. But Katy asked Dalton to stop straining when he sings. Katie Belle, a 19-year-old model and musician from Atlanta, GA, performed a soft rendition of Jennifer Hudson's "Golden Slumbers." Katy admitted she cast "a magical spell" on everyone and Luke was speechless, just blurting out that the beautiful model -- who slightly resembles actress Megan Fox -- is "a yes." Lionel loved her and said he was looking forward to seeing how far she can make it in the competition. Katy compared her voice to Stevie Nicks. After Katie earned her Golden Ticket and shook Luke's hand, Luke pretended to pass out because she's so gorgeous. And finally, Lauren Engle, a 27-year-old musician from Redlands, CA, sang a song she wrote for her late husband. The song titled "Compass," which was a timeline of the couple's life together, was beautiful and Katy felt the emotion behind the song and called Lauren "so strong." The judges gave Lauren three yeses and Luke said she has a really solid, good country voice.